Years ago, one of my writing teachers said that truth is stranger than fiction...because it can afford to be. She was talking, of course, about continuity and believability in plot. Just because something is "true" doesn't mean it works in a fictional world. Sometimes writers have to twist the truth to make it work within the world we create. 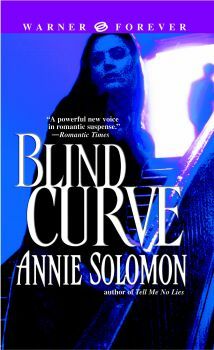 Which brings me to Blind Curve, my fourth, and, some say, my best book. It's the story of a detective who has a stroke that blinds him, leaving him imprisoned in a dark world while a ruthless killer he can't see is trying to assassinate him. Being the oversensitive, insecure person I am, I still remember the reviews who snarkly called this premise outlandish. Well, maybe I didn't do enough twisting. Or maybe no amount of twisting would have made some folks believe. But today, in the science section of the New York Times I saw an article that really would have rocked my fictional world. Seems there's a doctor who was blinded by a stroke similar to Danny's in Blind Curve. The amazing thing reported in the article is not that a stroke can, indeed, blind someone by taking out the centers in the brain that process visual imagery, but that even "blinded" this kind of sightless person can still "see." The thing is, a stroke effects the brain--just as I said in my book--so technically, there's nothing wrong with the eyes. If there were other parts of the brain that could interpret what the healthy eyes see, blindness could be overcome. Now, it seems, a Dutch study shows that these other parts exist. They are more primitive--perhaps older evolutionarily speaking--kind of like animal brains, which don't have the sophisticated visual lobes we have, but still manage to provide more than enough sight for survival. In the human brain, these areas are subcortical and we use them unconsciously, just as we use so much of our brain. To prove it, researchers sent the blind doctor down a hallway strewn with obstacles. They didn't tell the man that there were obstacles in front of him, they just told him to walk forward. To their astonishment, the doctor zig-zagged his way down the corridor, missing every single obstacle. What's more, the doctor didn't even know it. In fact, he thought he was walking straight. Is that cool or is that cool? So with practice, maybe a neurologically blind person--like Danny in Blind Curve--could learn to "see" on some level. If I'd known about this research before I wrote the book, I might have included it and Danny's story could have had a whole different ending. Which would really have set the critics off!! Suffice it to say, I have a sequel in mind. To read more, check out the article in the Times, and don't miss the video that goes with it. This must really be new data, because I happen to know you interviewed a neurologist and if this were widely known at the time, he would've certainly been up on it. Great article. I know my editor wouldn't let me do several things that were "true" in real life because they were too "coincidental" and overdone. Sniff. Sniff. However, being a dutiful author, I paid attention and rewrote the scene. BTW Blind Curve and Black Out are my two faves. I'd love to see a Danny sequel. BTW, I've got an idea for a Danny sequel that also involves Margo from Blackout. Wouldn't that be cool? Just haven't figured out who the MAIN characters are yet.